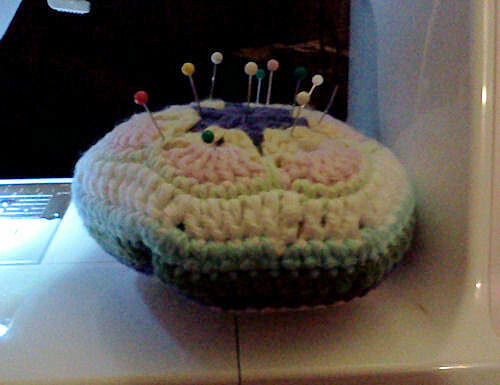 Motifs can be used in a variety of ways and a pincushion is a perfect way to use a single motif and some yarn scraps. A smaller hk than recommended for the yarn is used so that a tight st is achieved. Insert hk into st, yo and pull through, yo, pull through one lp on hk, yo, pull through both lps on hk. Insert hk into st, yo and pull through, yo, pull through one lp on hk, insert hk into next st, yo and pull through, yo, pull through one lp on hk, yo and pull through all lps on hk. 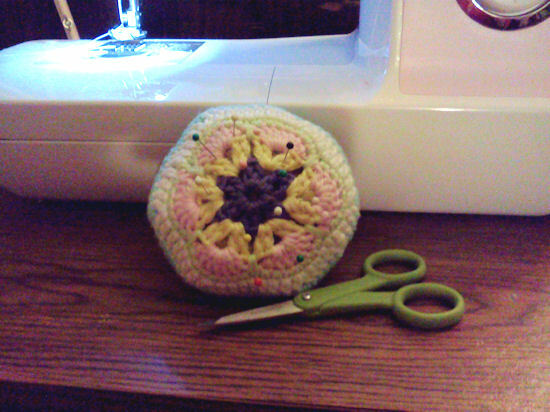 Make one motif following the instructions in African Flower, all the way through round 5. Round 1 Join next color with esc, esc in ea dc around with 2 esc in ea ch 1 sp. Join with sl st to first esc. Fasten off. Round 2 Join next color with esc, esc in ea st around with an esc2tog in the two sts in the ch-1 sp. Join with sl st to first esc. Fasten off. Round 3 Join next color with esc, esc in ea st around with an esc2tog over the previous esc2tog. Join with sl st to first esc. Fasten off. Rounds 4-6 Rep round 3 with different colors for ea round. Round 7 Join next color with esc, esc in next st, *esc2tog, esc in next 2 sts,* rep from * to * around. If there is an extra st after the last esc2tog, use an esc to end. Join with sl st to first esc. Fasten off leaving a long tail. Insert fabric scrap into opening to cover holes in top. Stuff foam into opening so it is slightly firm but not hard. Weave long tail into outside of last round and pull to tighten. Fasten off and push end inside.